Earlier this week I had a request to make one of my patchwork journal covers that I sell in my Etsy shop to fit a standard spiral composition notebook. I was excited to get started on a variation of what I normally make, and thought it would be fun to share how I made it with all of you. It should be noted that this isn’t a real step by step pattern, but rather more of a loose idea of what I did to make it. If something isn’t clear though, leave a comment, and I’ll do my best to clarify! 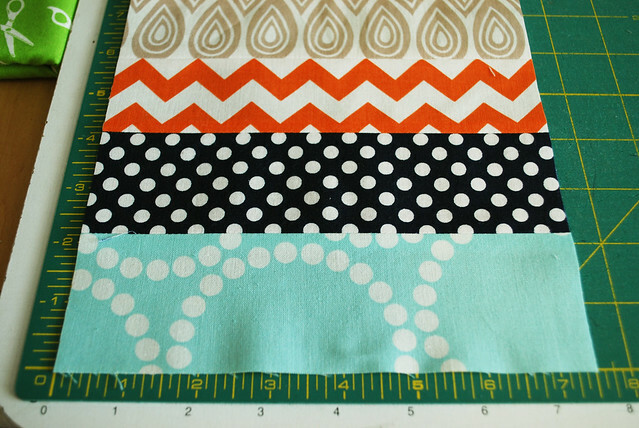 *6 strips of pretty quilting cottons, measuring at least 7 1/2″ wide x 2 3/4″ tall. 2.) 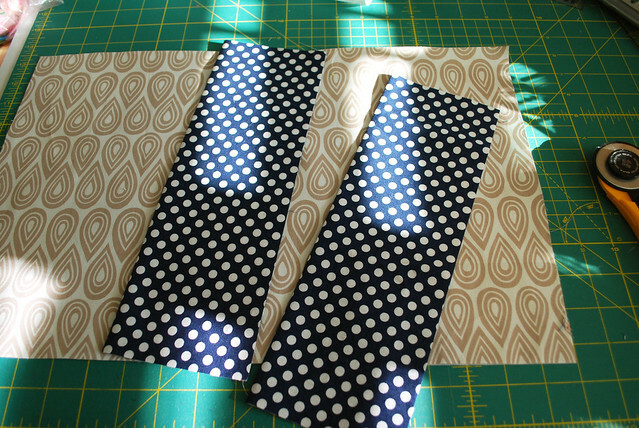 Sew them together with a 1/4″ seam allowance and press the seams nice and open. 3.) 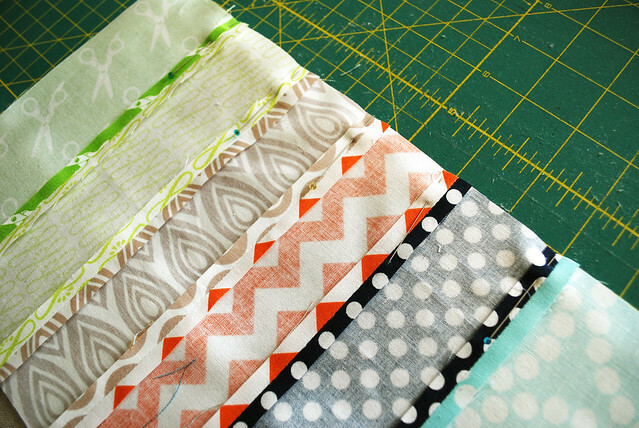 You’ll next want to trim down the sides of the patchwork, so that it measures 7 1/2″ wide. At this point, it still doesn’t matter too much how tall it is, as long as it’s at least 11 1/2″ tall. 5.) Cut a clean, straight line along one of the 12″ edges. Pin the left side of the patchwork to the linen. Sew 1/4″ from the edge. Press the seams open. 6.) Here’s where you’re going to start getting more accurate with your measurements. Fuse one of the interfacings to the back of the front panel, making sure that the right edge of the interfacing lines up with the right side of the patchwork. The panel will probably be larger than the interfacing, but this will give you the opportunity to shift the linen on the interfacing so that the warp and weft is as straight as possible. 7.) 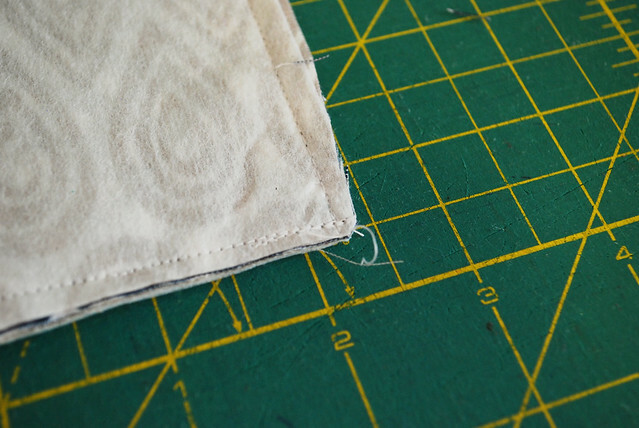 Flip the panel over and trim along the lines of the interfacing. 8.) 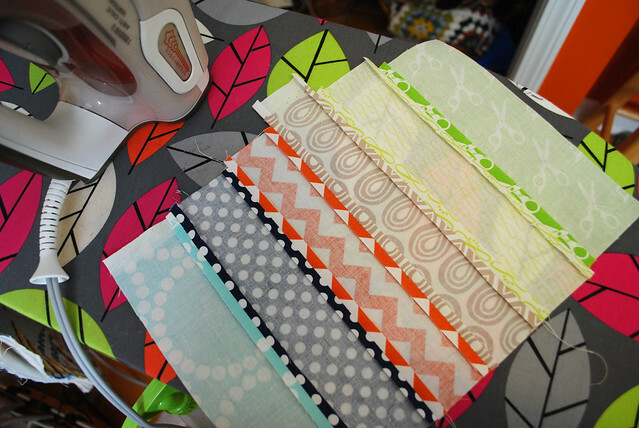 It’s time to quilt! Since there’s only two layers, the patchwork and the interfacing it’s not completely “quilting,” but this will give it the look of being quilted. It’s up to you on how you’d like to decorate it. 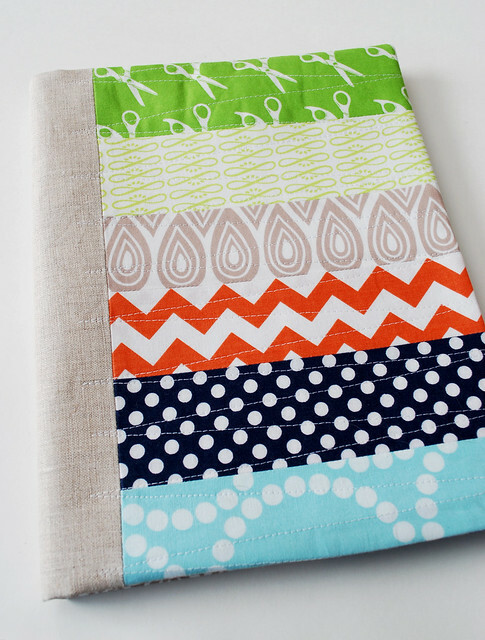 For these notebooks, I typically do a zig-zag line through the patchwork just onto the edge where the linen meets. It’s up to you as to how you want yours to look. 9.) Fuse the second interfacing to the wrong side of the lining panel. 11.) Place the front panel right side up and place each of the pockets with the long, raw edges aligned along the sides of the panel. Place the lining right side down on top of the front and pockets and pin along the right and left sides. 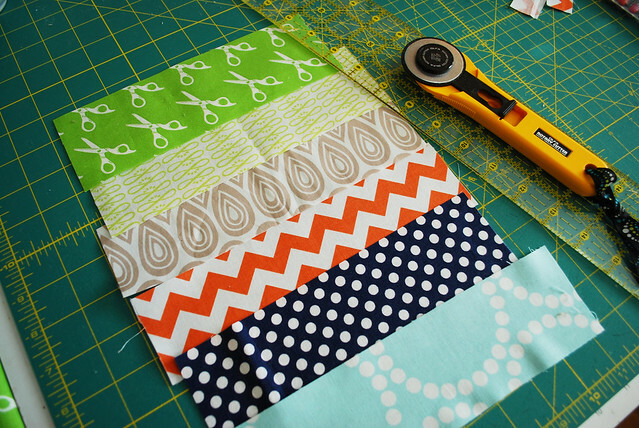 Sew both sides, using a 1/4″ seam allowance. 12.) If there’s excess fabric from the pockets, trim along the top and bottom. Pin both sides. Sew all the way across the bottom. Sew the top, leaving about 2″ open along the top, away from both edges. 14.) Press the cover nice and flat and without wrinkles. Slip stitch the opening at the top of the cover closed. 15.) There you have a finished notebook cover! 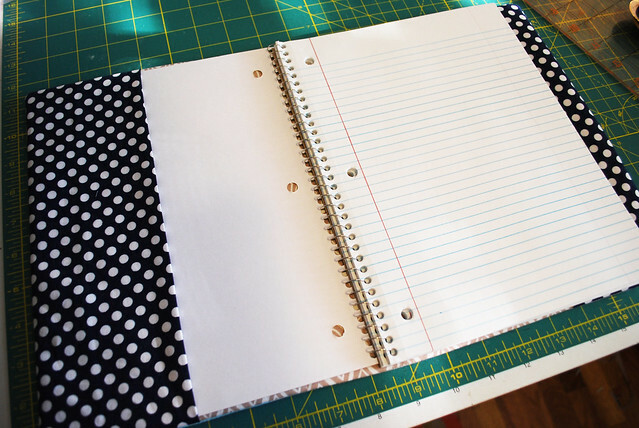 Slide in your notebook and go to town filling up your notebook. Great tutorial! 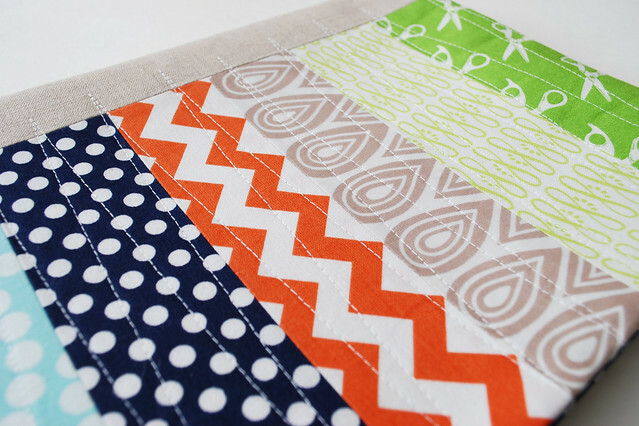 Love the zig-zag quilt – it adds that sophisticated touch to the patchworked cover. Thanks for sharing! It was fun to see a picture of your slippers in The Chelsea Standard this week.